"Quinoa is not a grain, but a seed." Heat a large saucepan over medium heat and swirl olive oil around the inside of the pan to coat. Cook shallot in the hot oil until translucent, about 3 minutes; stir in cremini mushrooms, cooking and stirring until mushrooms are browned, 8 to 10 minutes. 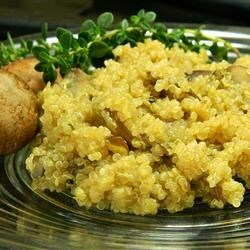 Stir quinoa, thyme, bay leaf, kosher salt, and black pepper into mushroom mixture. Cook, stirring often, until quinoa gives off a slightly toasted fragrance, about 5 minutes. Pour vegetable stock into quinoa mixture (stock may spatter a bit); stir to combine. Bring to a full boil, reduce heat to low, and cover pan; simmer until liquid is absorbed, about 15 minutes. Remove from heat and fluff quinoa pilaf with a fork; cover pan and let pilaf stand 10 more minutes to steam dry. I didn't even add the onions, and it turned out to be very tasty. I didn't have rice, so I chose this recipe. It beats rice by far. Very easy, fast and delicious. Even my little kids loved it! This dish was excellent and made more than I expected. Next time though, I would cut the salt in 1/2.